The new Two Wells School was opened on November 2nd 1979 by the Minister of Education Mr. Harold Allison. Planning for the new school had been assisted by the parent commitee from the former Two Wells school, and the school council was involved in tendering for contracts involving the initial planting of 700 native trees around the perimeter of the new block and then the landscaping and water reticulation system for the ovals. The Principal at the time of the transfer from the old to the new school was Mr. Alan Young. During the eight years Mr Young was appointed to the Two Wells, the school went from strength to strength and with the new buildings and changes in educational outlook a new era of education had begun. Mrs Christine Lidas joined the staff in 1979 and began also teaching Greek culture. From that time, staff members with migrant backgrounds have been teaching those cultures and languages where possible. Miss Kath Cannizzaro joined the staff in 1983. Through the years the academic progress of students has been nurtured together with their sporting prowess. The school has for many years combined with neighbouring schools in competitive sports and encouraged physical fitness. some former students who have succeeded at sport include Raymond and Mark Prior, Central District league football; Wayne Prior, SA State cricket team and member of Packer cricketing organisation; Gary Sharpe and John Mihaljevic, State junior hockey (1978). On 8 June 1983 the Two Wells-Mallala & Districts Community Library was formally opened at the school by Mrs Joyce Batty. The school council named the library building `The Alan Young Building' and invited Mr Young back to unveil the plaque commemorating the occasion. Recently the library has been relocated from the school grounds, to the former Two Wells Institute building. 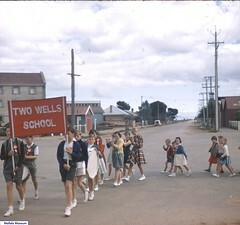 Do you remember Two Wells School ? Then Join up and add your memory here.